Diamond Weight: 0.28 ct. tw. 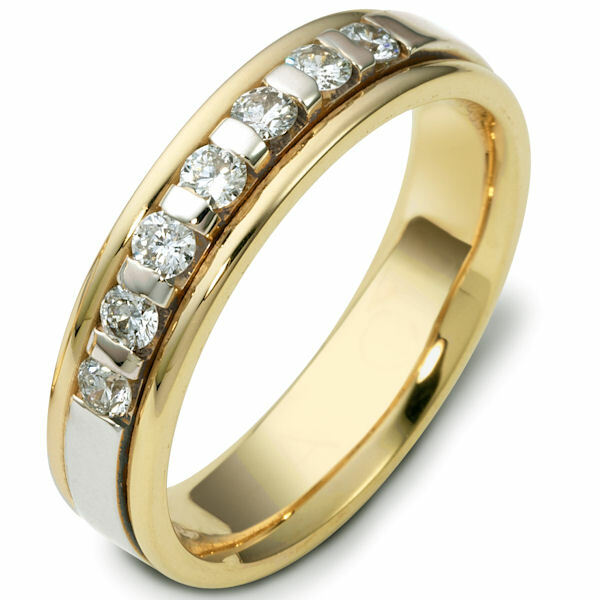 18kt Two-tone gold diamond, comfort fit, 4.5mm wide wedding band. The ring has approximately 0.28 ct tw diamonds, VS1-2 in clarity and G-H in color. There are 7 round brilliant cut diamonds and each measures about 0.04 ct. It is 4.5mm wide and comfort fit. The center is brushed and the rest of the ring is polished. Other finishes may be selected or specified. Im very pleased with the service and the information provided regarding the ring I purchased. Bling girl that I am I wish the diamonds were a bit larger. However they do sparkle when the light hits them. Thanks for your good customer service. We received our new Mens Wedding Band and it was even more beautiful than the picture! Thank you so much. After 50 years of marriage and my having lost my original wedding band this will be one my grandson will inherit when he gets married. A wonderful heirloom to pass on! These guys are splendid. I bought two wedding rings and sent back one to replace with a different model. Process of exchange was very painless and fast. Rings are good quality and good price. If I want to buy any ring in future I certainly will buy from WeddingBands.com.